I'd never heard of this game in all my time owning a Commodore 64, and in fact it was only quite recently when I first heard the name. I was therefore even more surprised to find it was considered to be something of a classic! How? Where? Did any of you ever see this reviewed, or sitting on a shop shelf anywhere? And so, with classics being meant to be played, I figured I'd dig out an emulator and give this one a bash. Playing the game wasn't as easy as I expected. This wasn't because of some insane difficulty level... the game wouldn't let me start! All you're supposed to do is select the number of players, press fire, select the difficulty levey, and press fire again. But I was hammering the crap out of the fire button, and it just wouldn't do anything. That was a bit annoying. Once I finally got started (apparently, a button press once in a while is acceptable), the game appeared with an enthusiastic but garbled "Hey Taxi". I was quite impressed... there are quite a few phrases here, and although it was about as rough as the speech from Rock 'N' Wrestle (Khhhhwah, Khhhoooo, Khhhreee), it was still quite an achievement, given the age of the game. 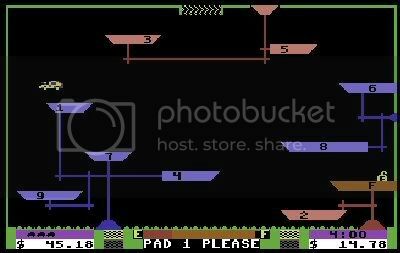 As for the game itself, it's a Lunar Lander affair... platforms litter the screen, and customers appear on the platforms at random. You have to pick them up and deliver them to their destination, and the quicker you do it, the better tip you get for a higher score. It's simple, tried and tested, but done very well. The inertia is pretty much spot-on, making controlling the Space Taxi a lot of fun. I did have an occasional problem in putting down my landing gear (fire button problems again! ), but other than that, it plays very nicely.